The Zetas have long stated described the Moon's supposed "rotation" as not a rotation at all but the Moon's Face glued to the Earth. There is a reason the lunar "rotation rate" (27 days, 7 hours, and 43 minutes) and the lunar period of orbit around Earth (also 27 days, 7 hours, and 43 minutes) are matched. What makes the Moon orbit every 28 days, around the Earth, making almost precisely 13 such turns in an Earth year? The Moon does not have a liquid core, as does Earth, so its rotation is driving by fixed points on or within the frozen Moon. We have presented the reasons for the Earth's rotation as a dog chasing its tail, the motion of liquid magma, uneven in its nature, chasing places in the Universe while finding it cannot stop once it has come as close to these attractants as possible, as the motion drives it on. The Moon has no such variable. We have described the rotation of the Earth, so precisely to the second each day, as driven in the main by an attraction to points in the Sun, so those parts of the Earth are trying to face the Sun each day, only forced to part, eager lovers that they are, because of the motion of the Earth and the Sun itself. The Moon likewise is very regular, despite the erratic orbit which has the Moon swinging too far to the North between New and Full Moon and then too far to the South, lately, in response to the press from Planet X, particles flowing from Planet X that the Moon wishes to avoid. The Moon obviously has a lopsided composition, as the Face of the Moon is glued to the Earth, staring at it constantly, so those on Earth never see the drk sde of the Moon. 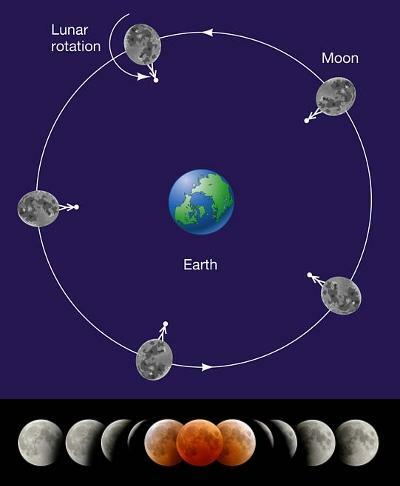 This is interpreted by some as a rotation of the Moon, but it is not the Moon that is revolving, it is the Earth that revolves. The Moon is merely following along, glued as it is to particulars in the Earth. Were the Moon stationary, and not orbiting the Earth, it would not have a rotation. But just as the Sun has sweeping arms that propel all the planets in a counterclockwise direction around the Sun, just so the Earth has sweeping arms that propel the Moon in its direction around the Earth. Where this the only influence on the Moon, the Moon would indeed be on the wrong side of the Earth from its predicted orbit, and within 6 months time. But this is not the only influence. 13 times a year the Moon's dark side is facing outward into the Universe, in the same direction. 13 times a year the Moon is impelled from this position by the sweeping arms of the Earth, which push it along to go round the Earth until it can come back to face that same point in the Universe once again. In a stalled Earth orbit or a moving Earth orbit, these 13 times a year are clicking along, like clockwork. Where the Earth is sped up slightly, 4 minutes a day, so that at high noon it is facing the Sun, which it synchronizes to, the Moon does the opposite, slowing down slightly so it can synchronize to those points in the Universe it is attracted to. Orbits, and rotation, as we have often stated, are not controlled by Newton's laws, some motion remaining constant over the eons, they are dynamic and controlled by attraction and repulsion among the moving bodies and points beyond!